I love the dried and candied fruit filled baked goods of the late fall and winter months. Not only are they delicious and seasonal (fresh fruits having diminished in supply by the time December rolls around), but from Britain's Christmas cake...to Italy's Panettone...to Germany's Stollen (just to name a few), they are part of a rich European tradition of holiday baking. Unfortunately, this style of baked good is not very much in favor in the U.S. I am at a loss as to why this is the case....but nevertheless, it seems to be true. One of my favorite holiday classes—all about desserts that feature these ingredients—has always been a bit of a hard sell. This year, that particular class was canceled altogether due to lack of interest. And yet, any time I sneak a dessert or bread of this style into a class filled with other things, it is often the hit of the class. If you count yourself among those who have shied away from these kinds of breads and desserts, today's post is for you. 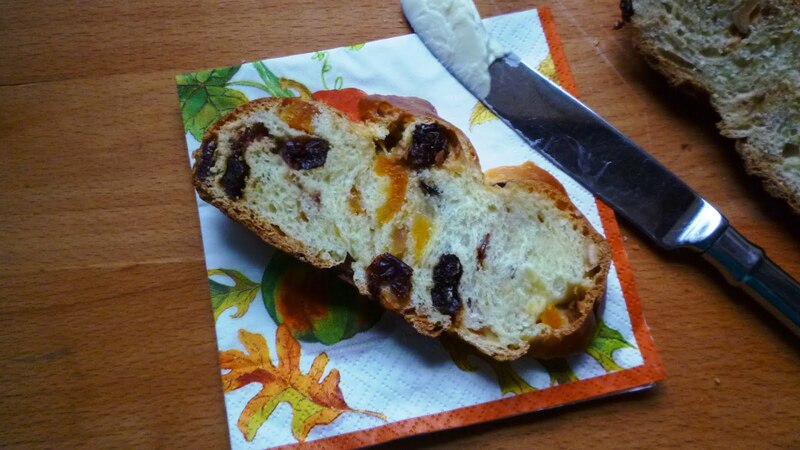 It is a great introduction to the world of dried fruit-filled yeast breads. This particular loaf is not nearly as heavy or rich as some of the traditional European loaves. Additionally, for those who are especially wary of candied fruits (which in the U.S. are awful most of the time), this is made with only dried fruits. The dough is slightly less sweet and rich than a typical cinnamon roll dough and it bakes into a beautiful braid that is tender and light. What's not to love? As it happens this loaf wasn't a part of the class that was canceled. That particular class was mostly a dessert class, and this loaf is definitely not a dessert. It is a variation of a Peter Reinhart bread that in its original form (filled with dried cranberries and walnuts) was created for a place on the Thanksgiving dinner table. While I imagine that it is delicious in that role, I think it is best served at breakfast or brunch. In its "day old" form, it makes fantastic toast. The flavors of my loaf are patterned after a favorite bread sold at Whole Foods (called a "Harvest" loaf). That loaf features dried apricots, dried tart cherries and toasted hazelnuts. I have added Medjool dates to the mix...but any favorite selection of fruits and nuts would work. I think pistachios would be particularly nice for Christmas. If you don't like nuts—or will be feeding someone with a nut allergy—simply replace them with an equal weight of dried fruit (golden raisins would be nice addition to the other fruits). 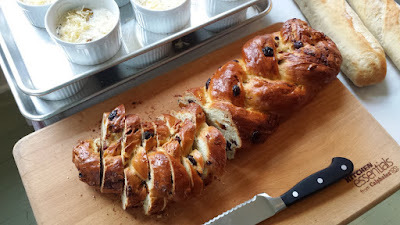 If you have never made a braided loaf before, it is not difficult. 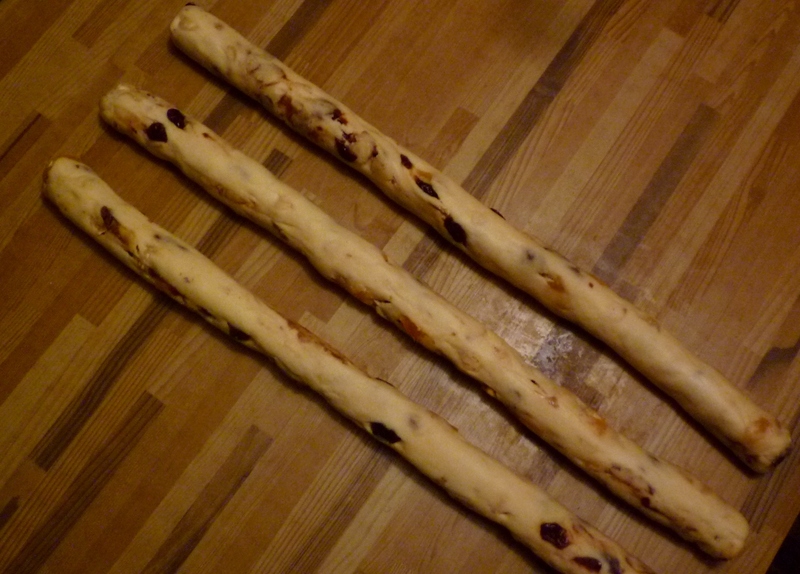 Make sure that your ropes of dough are all the same length and diameter. When you form the braid, don't make it too tight. Pinch the ends well, or the braid will start to come apart at the ends as it proofs and bakes. Finally, make sure the loaf is fully proofed, or doubled, before you bake it (it will look swollen and puffy and when lightly pressed with a fingertip, the indentation will remain). For many breads you can get away with putting them into the oven when they are not yet fully doubled, as the action of the oven will aid in boosting that last little bit of expansion. In some breads this extra oven spring is desirable, but not in a braid. Braided loaves that experience a large amount of oven spring look stretched and torn after baking. The bread will still taste fine if this happens...but it will not be as beautiful. Once you've tried this bread, you may want to try other dried (and candied) fruit and nut filled baked goods. If so, there are so many to choose from right here (I really do love them). 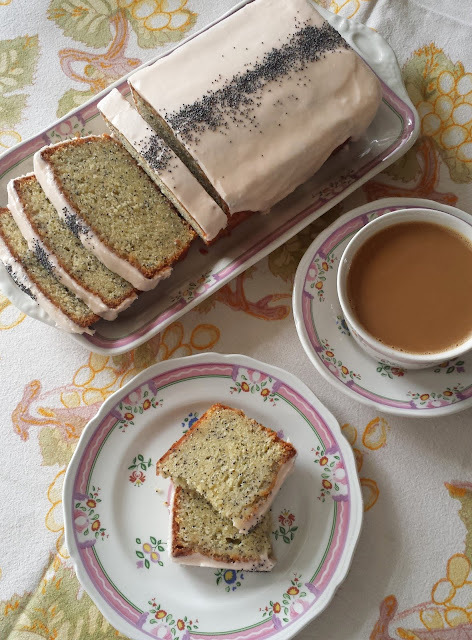 You could move on to the Brandied Fruit & Almond Tea Bread...basically a fruit and nut filled pound cake that could be considered a fruit cake "light". If your tastes run more to chocolate, there is Deborah Madison's Date, Dried Cherry & Chocolate Torte (basically chocolate fruitcake...). Then, returning to yeast breads, there is my Holiday Wreath Coffee Cake—scented with cardamom and orange and filled with dried cranberries and pistachios. I make this one every year for our Christmas breakfast....and this one would be a very easy sell among the dried fruit and nut-wary crowd since the fruits and nuts are ground finely prior to coiling them into the dough. And of course, you can always take basic baked goods and dress them up for the holidays by adding some candied peel and spices...as in my Spiced Cranberry-Orange Coffee Cake...which is just a simple and delicious sour cream coffee cake with additions. If you can't find good candied peel, it is easy to make. And it makes a wonderful addition to a holiday sweets platter as well. In a large mixing bowl soften the yeast in the warm water. Place 320 g. (2 1/2 c.) of the bread flour, the sugar and the salt in a small bowl and whisk to combine. Warm the milk and the butter in a small saucepan just until the butter melts. If the mixture exceeds 115°, let cool before proceeding. Add the warmed milk/butter, the eggs and the dry ingredients to the softened yeast and mix with a wooden spoon or stiff rubber spatula to form a soft dough. If the dough is unmanageably sticky, add more of the flour to bring it together…but only as much as necessary. Too much flour will create a stiff dough and will produce a dry loaf of bread. Add the dried fruits and nuts and gently knead until all of the nuts and fruit are incorporated and evenly distributed. and cover the bowl with plastic wrap. Let the dough rise until doubled in bulk (about 2 hours). Gently deflate the dough. (At this point, you may proceed with forming, proofing and baking, or, alternatively, cover again and place in the refrigerator overnight. In the morning, deflate again before proceeding.) Divide into three portions of equal weight and roll each portion out into a strand that is about 18 inches long. Make sure all of the strands are of equal length and diameter. 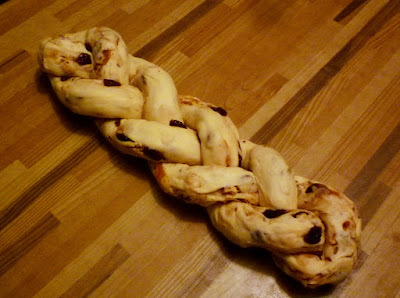 Braid the three strands together and pinch the ends to form a neat loaf. Transfer the braid to a parchment lined baking sheet and brush all the exposed surfaces with egg wash. Cover loosely with lightly buttered or oiled plastic wrap and let rise until fully doubled (it will look swollen and puffy and when lightly pressed with a fingertip, the indentation will remain)—about 1 1/2 hours. Carefully brush with a second coat of egg wash. Transfer the pan to the middle rack of a preheated 325° oven and bake until the loaf is a deep golden brown, feels very firm, and sounds hollow when tapped on the bottom—about 40 minutes (rotate the baking pan from back to front after 20 minutes of baking). The internal temperature at the center of the loaf should register about 185°. Transfer the loaf to a wire rack and let cool for at least an hour before slicing. This loaf is delicious as part of a brunch spread. It makes excellent toast. It is also good with cheese. Slightly stale slices would make good French Toast…or a delicious grilled cheese sandwich. Peter Reinhart makes his bread with dried cranberries and walnuts and serves it as part of his Thanksgiving spread. You may use any mix of dried fruits that you prefer. I like equal quantities of pitted, chopped Medjool dates, chopped dried apricots and tart cherries. Chopped toasted walnuts, pecans or pistachios would all be delicious, too. You may omit the nuts entirely and replace them with another 3 oz. of dried fruit. 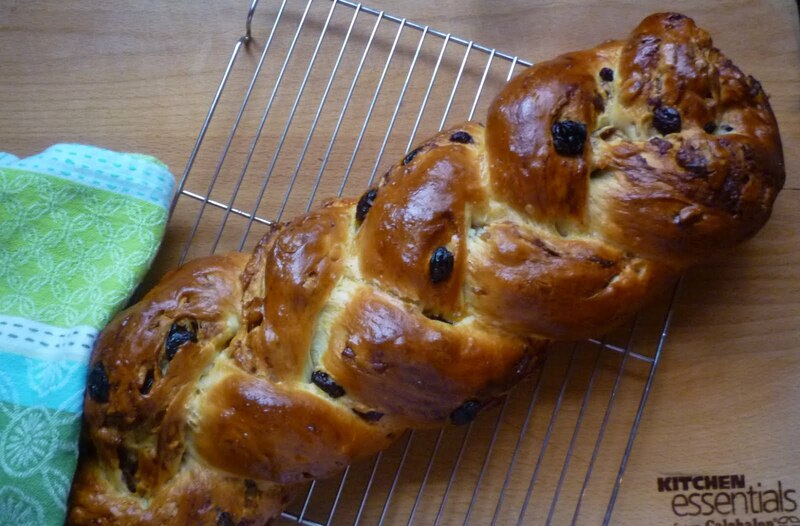 The double egg wash in this recipe produces a loaf with a deeply, burnished brown finish. If you would like a loaf that is not so dark, just egg wash once, right before baking.